Met Office warned of “well below freezing temperatures” for this morning in areas that are still affected by snow, as well as a “murky and misty” start for central and south-east England. The weather service also forecast a “few fog patches” which will slowly clear throughout the day. Met Office meteorologist Alex Deakin said: “Tuesday morning still starting off with a frost in many places, and a few fog patches around too which may take a while to clear away. Certainly, a cold start, towns and cities down close to freezing across Scotland, if not a touch below, and where there’s snow lying on the ground temperatures are well below freezing here. “Some fog here and there across northern England, patchy but dense in places, a murky and misty start too across parts of the Midlands and south-east England. The Met Office weather presenter added: “Having said that much of eastern England, good part of central and eastern Scotland will be largely dry and bright. “But only once the fog’s cleared, and the fog may take quite a while to clear. Here comes the rain into Northern Ireland so turning damp here. BBC Breakfast’s Carol Kirkwood also forecast a cold start to this morning, as well as some heavy downpours. The BBC weather presenter said: “A widespread frost and also some fog, dense fog at that, especially across parts of northeast England and southern England. “But you could run into fog across the Midlands, in parts of Wales and southern Scotland as well so do take extra care. “We have also got some rain coming in from the West, in the green hues in the charts, that is where the temperature isn’t as low, that is where we have got the cloud already. “We will see some patchy light rain and drizzle coming out of that before we see more persistent rain later. 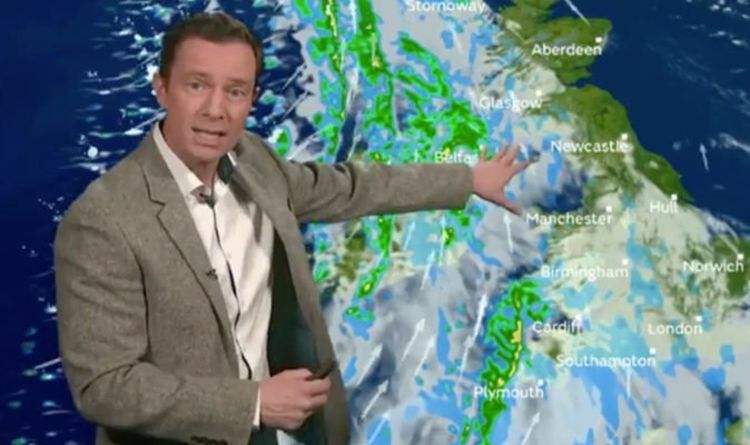 “That is courtesy of this weather front, it is a warm front, behind it you will notice the temperature will be higher than it has been of late.